How Matjumpa Got Her Pouch. Chern’ee Sutton is a 21 year old contemporary Indigenous artist from Mt Isa, Queensland. Her great, great, great grandmother is listed as an apical ancestor of the Kalkadoon tribe and her uncle is a Kalkadoon community chairman. Chern’ee began painting at 13 years old in 2010, when her school teacher encouraged her to enter the Yoorellgoo Indigenous art competition, in which she won first place in the painting category. She had never painted before. From this point onwards, Chern’ee Sutton embraced painting and worked ‘madly’ and constantly throughout the next 4 years; a journey that has rewarded her hard work with a plethora of both national and international successes. Most notably and recently, Chern’ee was awarded the NAIDOC National Youth of the Year Award for her contribution to the arts community. Her fervid, bold and vivacious approach to painting her family’s stories is simply inimitable and visually unique in colour, composition and texture. Chern’ee embodies her ancestor’s culturally sacred stories in a style that is both perceptive and optimistic; a reflection of a young Aboriginal person’s view on their identity and culture. Chern’ee’s artistic objectives are to promote reconciliation and enable a deeper understanding and appreciation of Aboriginal life and culture. Her positive spirit, buoyancy, pride and good will are engrained on the surface of the canvases she diligently produces while simultaneously completing high school. Her various achievements mirror the inspirational figure that Chern’ee has become, proving that despite her young age, anything is possible when ambition meets passion. January, 2018 Australia Day Ambassador in Charters Towers for their Australia Day celebrations. December, 2017 One of my NRL Indigenous All Stars paintings displayed at the Sofitel Hotel in Brisbane for the Rugby League World Cup Final. December, 2017 Artwork donated to the Save The Children Australia Office in Mount Isa, the artwork was used as a vinyl wrap on the windows/doors of the office. November, 2017 Artist in residence at the 2017 Defence Aboriginal Torres Strait Islander Network Conference where I created an interactive art piece for the Australian Defence Force. I was also a guest speaker and the commissioned artwork will be used for the ADF RAP, stationary, directorate merchandise etc. November, 2017 Official opening of my exhibition at the Pullman and Mecure hotels, King George Square Brisbane. November, 2017 Paintings exhibited with Aboriginal Art Galleries at the Singapore affordable art fair. October, 2017 Announced as the Queens Relay Baton Bearer for Bundaberg for the 21st Commonwealth Games in 2018. October, 2017 Paintings exhibited with Aboriginal Art Galleries at Battersea Art Fair in London. September, 2017 Asked to be the new Resident Artist at the Pullman and Mecure hotels in Brisbane's King George Square with a permanent exhibition of 16 of my artworks installed. September, 2017 Exhibition of my artworks at Aboriginal Art Galleries in Sydney which also incorporated the national Launch of my new jewellery range Chern'ee Sutton Originals. I was also an artist in residence painting artworks for 2 days in the gallery. Septmeber, 2017 Spent 5 days on the Gold Coast finishing off the large 14mtr painting called "Journey to Gold" at the Commonwealth Games Volunteer centre. In total there are over 20,000 volunteer and dignitaries' fingerprints on the painting which will be displayed at the Commonwealth Games Athletes Village during the Games. August, 2017 Attended Queensland Government House to celebrate Queensland's Arts and Cultural Community with His Excellency the Honourable Paul de Jersey AC, Governor of Queensland. August, 2017 Artwork used by the Diocese of North Carolina on the Spanish-language ministry website. August, 2017 Designed the new packaging and story for macadamia Australia new range. July, 2017 Attended Queensland Government House to celebrate NAIDOC Week with His Excellency the Honourable Paul de Jersey AC, Governor of Queensland. July, 2017 Painted with volunteers at the Commonwealth Games Volunteer selection centre. So far there are 11,000 fingerprints from the volunteers with another 9,000 to go. July, 2017 Attended a reception in Bundaberg to welcome the His Excellency General the Honourable Sir Peter Cosgrove AK MC (Retd) and Her Excellency Lady Cosgrove. May, 2017 Reconciliation artwork used by Uniting Care Kippax for their "Tracks To Reconciliation" flyers for Reconciliation Week. May, 2017 Reconciliation artwork and story used by the National Rugby League for the Indigenous round. Also used as a downloadable profile picture customisation on facebook. May, 2017 My painting which was used for the 2017 Indigenous All Stars jersey is being exhibited at Brisbane Novatel Hotel for the NRL's Indigenous round. May, 2017 Attended the Queensland Young Achiever Awards for 2017 where I won the Kennelly Constructions "Aboriginal Achievement Award". May, 2017 Artwork used for the Queensland Writers Centre book which is being published in September and features my artwork on the front and back covers as well as throughout the book. May, 2017 My artwork was used by the NRL on all referee's jerseys for the Indigenous round weekend. May, 2017 Paintings exhibited in an art show in Hong Kong for 3 days with Aboriginal Art Galleries. May, 2017 Interviewed by Bomber TV about my Guernsey design for the Essendon Bombers Dreamtime at the G game. May, 2017 Addressed the Essendon Football players and explained the significance to my design on their Guernseys and the story to the artwork. May, 2017 Participated in The Long Walk with Michael Long and walked on field around the MCG. Watched the Dreamtime at the G AFL game with Essendon wearing my Guernsey design. My artwork was also displayed on LED signage around the stadium. April, 2017 Guest speaker at Elliott Heads ANZAC Day event where I read my poem "Dreamtime Soldier" as a tribute to the black diggers that gave the ultimate sacrifice for our country. April, 2017 Attended the opening of the Gold Coast Commonwealth Games Volunteer selection centre. I have painted a 9 metre painting which tells the story of Australia and the Commonwealth Games. Dignitaries placed their fingerprints on the painting and the 24,000 volunteers will also place their fingerprints on the artwork. During the Commonwealth Games the painting will hang in the Athletes village. March, 2017 Featured on Kochies Business Builders website as 1 of 10 inspiration business women for International Women's Day. March, 2017 Held a painting workshop with special needs kids at Caring Hearts in Bundaberg. February, 2017 Held a painting workshop with 64 students at Newcastle University for the National Rugby Leagues 2017 Youth Summit. February, 2017 Attended the National Rugby Leagues All Teams Dinner with the World All Stars and the Indigenous All Stars players. February, 2017 I painted the centrepiece of an 8 square metre canvas and then had the National Rugby Leagues World All Stars Squad and the Indigenous All Stars Squad all place their handprints and signatures around the centrepiece. This significant artwork will be sold and money raised will go to the Preston Campbell Foundation. February, 2017 Attended the NRL's All Stars Game in the corporate box where my artwork was used on tablecloths, screens, poles, bars, footballs, Indigenous All Stars Merchandise etc and also on the men's and women's Indigenous All Stars Jerseys. February, 2017 Designed the acknowledgement and recognition plaque for Widebay ABC to hang on the outside of their building to pay respects to the local Aboriginal peoples of the area. February, 2017 Held a painting workshop with special needs kids at Caring Hearts in Bundaberg. February, 2017 Started painting a local Dreamtime story from the Taribelang Bunda people in Bundaberg in conjunction with Bundaberg Police and "Kids at Risk". The mural took 6 weeks to complete at a local shopping centre with the idea behind the project to bring the whole community together. February, 2017 Artwork used on the RECOGNISE Youth AvantCard campaign my artwork will be on display in shops,cafes and universities around the country. January, 2017 Artwork image used by Caritas Australia for an Employment Information card for the Yabun Festival in Sydney. January, 2017 Held a painting workshop with special needs kids at Caring Hearts in Bundaberg. January, 2017 Artwork used on the cover of the service leaflet for the convention of the Diocese of East Carolina (The Episcopal Church and Anglican Communion). January, 2017 Motivational guest speaker at Wandoan Public School. January, 2017 Australia Day ambassador at Wandoan Australia Day celebrations for 2017. December, 2016 Attended the launch of the NRL's Indigenous All Stars Jerseys for 2017. This is the 3rd time I have designed the mens and womens Indigenous All Stars jerseys and my painting called Thaamu, Caina Putut, Ilya, Wartanganha has been used for all official NRL Indigenous All Stars merchandise. November, 2016 Designed framed bark paintings for the Gold Coast Tourism Ambassador awards night. November, 2016 Key note speaker at the Queensland Tourism Industry Councils "Tourism Indigenous Employment Forum" in Brisbane. November, 2016 Souvenirs, gifts, chocolates and framed painting donated to the Bundaberg Mayors Christmas appeal. November, 2016 2 framed paintings donated to the Qld Premiers offices for the White Ribbon Day breakfast fundraiser. November, 2016 Attended Queensland Government House for a luncheon function with his Excellency The Governor General to celebrate Queenslands visual artists, I was one of 12 artists invited. November, 2016 1 of 3 judges for the FABulous Awards in the Bundaberg Region which recognises individuals and community groups for their outstanding work with children. November, 2016 Paintings displayed and sold in an art exhibition in Singapore. November, 2016 Artist in residence at Dreamworld on the Gold Coast painting a memorial with the Dreamworld staff and guests for the 4 lives lost on the Thunder River Rapids ride. October, 2016 Artwork used for the Gold Coast 2018 Commonwealth Games Forerunners T-shirts. July, 2016 Designed the Team wear and jersey design for the Indigenous All Stars Soccer game for the Mount Isa team. June, 2016 Designed the Logo for Mount Isa soccer and also the logo for the Indigenous All Stars Soccer game for the Mount Isa team. June, 2016 Designed a painting that will be used on the Mens 2017 Indigenous All Stars Jersey. I also designed another painting that will be used on the Womens 2017 Indigenous All Stars Jersey. June, 2016 Artwork used on the cover of a book called "A companion to the works of Kim Scott" published in The United States. May, 2016 Inspirational guest speaker at Hymba Yumba Indigenous School talking about my career and artwork. May, 2016 Guest speaker for GOLDOC at Gumurri in Griffith University Gold Coast Campus encouraging Indigenous uni students to apply for an internship for the 2018 Commonwealth Games and explaining the story behind the Indigenous symbols on Borobi the GC2018 Commonwealth Games Mascot. May, 2016 Photo shoot and media interviews with Borobi the 2018GC Commonwealth Games Mascot at Dreamworld on the Gold Coast to celebrate the launch of National Reconciliation Week. May, 2016 Attended the Yugambeh Jarla where I was a Yugambeh Champion for the night. I was also an artist in residence at Sky Point on the Gold Coast where over 200 guests put their fingerprints on an interactive painting display that depicted the Yugambeh dreamtime story of the Yugam-Bunyip. Guest speaker on the night where I presented the Yugambeh people with thedonated artwork. painting for the Preston Campbell Foundation. I also had an exhibition of my paintings and held a free painting workshop for over 30 children. April, 2016 Attended the official launch of the 2018 Gold Coast Commonwealth Games Mascot Borobi at Burleigh Heads Beach. Borobi the koala features my artwork and story of the Commonwealth Games on his paws and feet and my artwork is also used in his name, on his surfboard as well as advertising signage. April, 2016 Attended the launch of Borobi at Jupiters Casino on the Gold Coast where I also gave a speech explaining the story to the artwork on Borobi's paws and feet. excelled in our fields for National youth week. March, 2016 To celebrate International Womens Day I was chosen as an amazing woman with my story shown online by 33 Creative for this month. and myself through several social media platforms. February, 2016 Artwork designs used for the Indigenous All Stars Deadly Choices Health Campaign T-Shirts. painting workshop with 59 children from the Youth Summit. February, 2016 Attended the 2016 Indigenous Leaders Dinner. February, 2016 Filmed a Juiced TV segment at the Lady Cilento Childrens Hospital. their handprints around the painting which I then donated to the hospital. February, 2016 Attended the NRL's All Stars Game in the corporate box where my painting was exhibited along with my artwork being used on banners, screens, lights, poles and tablecloths. The men's and women's teams used my jersey designs as well as the new Indigenous All Stars Logo's. January, 2016 Australia Day Ambassador at Muttaburra and Barcaldine Australia Day Celebrations handing out Australia Day Awards and participating in Australia day Activities. January, 2016 Inspirational guest speaker at Barcaldine State School. December, 2015 Selected by Triple J radio station as 1 of 25 under 25's across Australia for being one of Australia's most extraordinary people under 25.
also been designed by myself. November, 2015 Paintings exhibited by Aboriginal Art Galleries at the Affordable Art Show in Singapore. November, 2015 Indigenous artwork designs used in the logo for the 2017 Rugby League World Cup. November, 2015 Selected as an Australia Day Ambassador for Australia Day 2016. Coast Commonwealth Games (GOLDOC) at the opening of their new office. Dignataries placed their handprints on the painting on the day, the painting now hangs in the 2018 Commonwealth Games offices. October, 2015 Artist in residence at Dreamworlds Coroborree exhibition painting a 15ft canoe, guests at the Yugambeh Jarla that night placed their thumb prints on the canoe. The canoe is being donated by myself and Dreamworld to an Indigenous charity which will be decided at a later date. September, 2015 Artwork used for F.O.G.S. 2015 to 2017 Reconciliation Action Plan. September, 2015 Painting donated to the Asbestos foundation to raise funds. September, 2015 Guest speaker and handed out prizes at Bundamba Primary School who won the major prize for the ARTIE Reconciliation Challenge, also painted a large painting with 500 students as part of the first prize. September, 2015 Artwork used for Caritas Australia's new Reconciliation Action Plan. August, 2015 Artwork from this years Indigenous All Stars painting used on the front cover of Big League magazine as well as a dedication to me being the artist. round will wear jerseys with my designs on them. August, 2015 Judged the artworks from the ARTIE Reconciliation Art Competition. August,2015 Painting donated to the Mayors Charity Ball in Bundaberg to raise funds. July, 2015 Guest speaker at Gin Gin High School for NAIDOC week celebrations, also the judge for the art competition. July, 2015 Artwork used for the NRL's Indigenous Round Showcase. June, 2015 Teamed up with the ARTIE program who have taken the concept of my reconciliation art competition to 17 schools across Qld. Indigenous All Stars branding for 2016.
used in the brochure and the artwork is called Jullen Guh & Tankin. dignitaries place their handprints around the border of the painting. residency initiative where I guided students , staff and mentors in painting totem poles for each year level from prep to year 12. May, 2015 Attended the Qld Reconciliation Awards at Qld Parliament House. The painting I painted on Australia Day "All One Country" was raffled off on the night and won by one of the finalists at the awards. May, 2015 Attended the Yugambeh Mobo on the Gold Coast, with permission from the Yugambeh Language group I painted the creation story of the Gold Coast and had elders and Yugambeh champions place their handprints around the painting which has been gifted to the Yugambeh museum. Maryborough and Bundaberg Districts Yellow and White pages. Achieve Resource to be used primarily with School children. project as well as being a guest at their Cultural Diversity Day. proceeds going to AIME which is an Indigenous mentoring program. and presented Preston Campbell with a hand painted football of mine from the NRL and Preston Campbell presented me with my Indigenous All Stars Jersey. February, 2015 Attended the NRL's All Stars Game in the corporate box where my painting was exhibited along with my artwork being used on banners,screens, lights, poles and tablecloths. I was also interviewed on centre field with my painting "Thapu Wani Watina" by Luke Carrol where I told the story behind my painting. commissioned by the Australia Day Council to paint a reconciliation painting at Southbank called "United Australia". December, 2014 Attended the launch of the NRL 2015 All Stars Game on the Gold Coast. My painting Thapu Wani Watina which means 'Brothers Playing Side by Side' in the Kalkadoon language is being used for the Indigenous All Stars Jersey as well as on footballs, caps, shorts and a whole range of supporter merchandise. November, 2014 Paintings exhibited and sold by Aboriginal Art Galleries at the Affordable Art Fair in Singapore. November, 2014 Selected as an Australia Day Ambassador for Brisbane Councils 2015 Australia Day Celebrations. November, 2014 Guest speaker at the Order of Australia Medal or OAM Christmas gathering in Gayndah. October, 2014 Attended the Queensland Pride of Australia Awards night where I won the Queensland 2014 Pride of Australia Youth Leader Medal. generations by The State Library of Queensland. September, 2014 Organised and held a Primary School Reconciliation Art Competition in Mount Isa with 7 Primary schools. The competition was called "Ajarku Muruu' All One Country. 2 large installation art pieces were donated to the winning Schools with the children adding their handprints. September, 2014 Painted 2 power poles at Tharrapatha Way in Mount Isa. Tharrapatha Way is a cultural walking trail project. The second pole was also painted with Primary School students from Cloncurry. September, 2014 Selected as one of three finalists in the Young Leader Medal Category for the 2014 Queensland Pride of Australia Medal. "Brothers Playing Side by Side" in the Kalkadoon language. Round which featured my artwork which was donated to the A.R.T.I.E program. August, 2014: Artwork featured at the closing ceremony of the 2014 Glasgow Commonwealth Games with Jessica Mauboy singing in front of one of her paintings during the official handover of the Commonwealth Games to the Gold Coast. .July, 2014: Story published in The Koori Mail and the National Indigenous Times about the National NAIDOC Awards of which she was awarded ‘NAIDOC National Youth of the Year’. 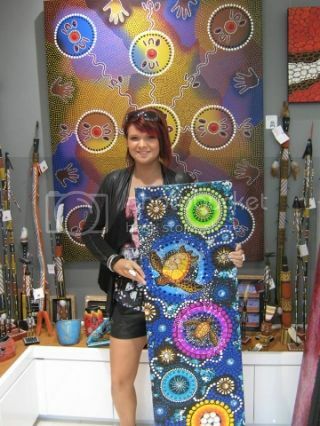 .June, 2014: Exhibition of her artwork displayed at the Queensland Indigenous Lawyers “World Indigenous Congress”. One of her paintings was also used as the logo for the conference. .June, 2014: Water tank painted at Ashfield Country Practice +Doctors Surgery. .May, 2014: First prints produced by Bundaberg Regional Council from the painting she was commissioned to paint for them. .April, 2014: Story published in The Guardian about her Royal encounter and her reconciliation painting that was gifted to the Duke and Duchess of Cambridge. .April, 2014: Attended the awards night for the National Youth Awards at the National Gallery of Australia in Canberra. She was 1 of 4 finalists for the Cultural Understanding Award. .April, 2014: Story published in Art Trends Magazine, Canada about her art and career as an Indigenous contemporary artist. .March, 2014: Artwork selected to be used on the Oxfam 2015 Reconciliation Art Calender. .March, 2014: Paintings displayed at Palm Lakes Resort Art Exhibition at Coral Cove. .March, 2014: Officially handed over the A.R.T.I.E. painting that she designed and donated to Gene Miles and Matt Martin, managers of education programs at ARTIE at the F.O.G.S. office in Brisbane. .February, 2014: Images supplied to Medicare Local on the Central Coast N.S.W. to use on their T-Shirts. .February, 2014: Commissioned by Dreamworld to paint 2 large 8Ft paintings that will hang in their Billabong Restaurant. .January, 2014: Presentation of the “Junior Creative Australia Day Spirit Award” for Bundaberg presented by Bundaberg Mayor Cr Mal Forman. This is the second time Chern’ee has won this award. .January, 2014: Exhibition at the Australian Open in Melbourne, she was also an artist in residence and painted an installation art piece that the tennis players and celebrities added their handprints to. The large artwork will be on display at Tennis Australia and features the handprints and signatures of players and celebrities including Redfoo, Sloane Stephens, Patrick Rafter, Marinko Matosevic, Marion Bartoli, Henri Leconte, Sara Tomic and Ian Goolagong. .January, 2014: Painting and copyright donated to the A.R.T.I.E. program, the painting will hang in the A.R.T.I.E. main office and the design will be used for t-shirts, hats, stationary etc to be given as incentive gifts to the A.R.T.I.E. students. .December, 2013: Asked by the Bundaberg Regional Council to paint a painting that represented the whole Bundaberg region that they could use in promotional material and products to promote the region to the many tourists that visit Bundaberg each year. The painting was brought and the copyright to the painting was donated to the Bundaberg regional Council. .November, 2013: Painted a large installation art piece with 1900 indigenous students that are part of the A.R.T.I.E. program as well as the A.R.T.I.E. mentors and celebrities including Tahan from Big Brother and Former Origin Greats Gene Miles and Steve Price at Dreamworlds White Water World for the 2013 Artie Beetson Fun Day. The banner was donated to the A.R.T.I.E. program once completed. .November, 2013: Four paintings sold to Dreamworld on the Gold Coast. One painting donated to Dreamworld. .November, 2013: Artist in residence for two weeks at Dreamworld on the Gold Coast. She was commissioned by Dreamworld to paint 8 totem poles in the Dreamworld Corroboree display with the permission of the Kamilaroi elders and the Yugambeh language group. .November, 2013: Attended the Queensland Australian of the year award ceremony at the Queensland State Library where she was one of 4 finalists in the QLD Young Australian of the Year Awards. .October, 2013: Interview and broadcast by channel 7 news about being a finalist in the QLD Young Australian of the Year Awards. .October, 2013: Image supplied to Gilkerson Legal to use on their 2013/14 Christmas cards. .October, 2013: Selected as 1 of 20 National Indigenous Youth leadership Academy students to participate in “Unleashed”. Unleashed is Australia’s first national summit for young change makers. .September, 2013: Won the Stanza IT “Youth Award” at the Bundaberg Arts Festival. .September, 2013: Commissioned by Tennis Australia to paint 10 boomerangs that will be used as gifts when the Australian Davis Cup team play against France in 2014. .September, 2013: Featured artist at the 2013 Artoriginal exhibition held at Brisbane Town Hall. Painting donated as well with all proceeds going to the Safe Sista Foundation. QGC purchased one of her paintings at the exhibition and the artwork will be used for their 2013/14 Christmas cards. .September, 2013: Painting donated for an auction with the money raised going towards the QLD Indigenous u15s rugby league team to help get them to Papua New Guinea. .August, 2013: Painting designed and donated to the Indigenous Lawyers Association of Queensland. The design is used for the Indigenous lawyers World Conference which is being held in Brisbane in 2014. .August, 2013: Handed over 4 commissioned paintings to the Bundaberg mayor that will be taken to China to give as gifts to Chinese dignitaries from Bundaberg’s Chinese sister city Nanning. .August, 2013: Painting designed and donated to The Bundaberg Woorabar Elders. The painting design will be used as their new logo. .August, 2013: Painting donated to Shalom College for a raffle with the funds going to Phoenix House in Bundaberg that deals with victims of sexual violence. .July, 2013: Book published featuring her artwork on the front cover. The book is called “A Companion to Australian Aboriginal Literature” and is sold worldwide. .July, 2013: Official acceptance to NIYLA (National Indigenous Youth Leadership Academy). In August, 50 Indigenous students come together from across Australia for NIYLA’s ‘Many Voices, One Future’ National Academy in Sydney for a week long program. .July, 2013: Awarded “Artist of the Year” for Wide Bay NAIDOC week 2013 at the NAIDOC Week ball. .July, 2013: Official launch of NAIDOC week and the 2013 Deadly Stories campaign at The Gallery of Modern Art in Brisbane. Chern’ee was chosen along with 12 other people to have their Deadly Story displayed on posters, postcards, banners and the internet across Queensland for 2013. .June, 2013: Official handover of 4 commissioned paintings to Tennis Australia. The paintings were accepted by Ian Goolagong the national indigenous Tennis Australia coach and Brenda Tierney the inclusion coordinator for Tennis Australia at a ceremony attended by Bundaberg Mayor Cr Mal Foreman and Member for Burnett Stephen Bennett. .June, 2013: Exhibition at Queensland Parliament House which was part of the Bundaberg Promotion night organised by the Honourable Stephen Bennett MP member for Burnett. .June, 2013: Baton designed, painted and donated to the North Queensland Sports Foundation featuring traditional Kalkadoon designs. The baton will be used for the opening ceremony for the Xstrata great western games. .June, 2013: Artist in residence at the Queensland State Libraries ReconciliAction day where she painted an installation art piece with the public that will be hung in the library in the Loris Williams room. .May, 2013: Artwork image supplied to Prince Alfred College in South Australia for their Reconciliation Week programme for 2013. The artwork is being used on a reconciliation postcard for each of the students. .May, 2013: Won the Queensland Alumina Award at the Captain Cook 1770 Art festival which was 1st place for the best artwork exhibited. 27th to the 31st March with several paintings sold which includes a painting sold to the Deputy Prime Minister and Treasurer The Honourable Wayne Swan MP. .March, 2013: Paintings displayed and sold by Aboriginal Art Galleries at The Affordable Art Fair in Hong Kong. .March, 2013: Official acceptance to YMCA Queensland Youth Parliament for 2013. She was appointed to represent Qld Indigenous electorates and placed on the Sport, Tourism and Arts Committee. As a youth parliamentarian she will be representing the needs of and speaking for the youth of her electorates. .February, 2013: Painting called “Caina Putut” donated and presented to the QIECC Queensland Indigenous Education Consultative Committee to hang in their Brisbane office. .February, 2013: Painting on loan called “Battle Mountain” officially presented to The Honourable Glen Elmes MP who is the Minister for Aboriginal and Torres Strait Islander and Multicultural Affairs and the Minister assisting The Premier. The painting has been loaned to The Honourable Minister and now hangs in The Aboriginal and Torres Strait Islander and Multicultural Affairs office in Brisbane. .February, 2013: Painting called “Walking Together in One Country” presented and donated to Caritas Australia in appreciation of their commitment towards reconciliation and a united Australia. .January, 2013: Full page story published in the National Indigenous Times about her two reconciliation paintings that have been sent down to Caritas Australia’s main office in Sydney. .January, 2013: Painting called “How Matjumpa Got Her Pouch” and some of her souvenirs donated as the major prize for the Bundaberg mayor’s chaplaincy support raffle. .January, 2013: Artist in residence and paintings and souvenirs displayed at Bundaberg Regional Art Gallery in a new initiative called “Meet the Maker”. .November, 2012: Exhibition of her paintings displayed at the opening of the new Bundaberg Catholic Parish. .November, 2012: Story and photo published in the News-mail newspaper about the painting she donated to the Make-A-Wish Foundation. .October, 2012: Painting displayed at the “Artoriginal” Beyond Billabong Foundation Inaugural Indigenous Art Exhibition held in Brisbane, Qld. Her painting sold for $3,500.00 and was sold before it was hung and displayed in the exhibition All proceeds were donated to the Beyond Billabong Foundation which will be used to help Indigenous youth. .October, 2012: Story about her achievements called “Master Stroke” published in “DOLLY” magazine November issue. .September, 2012: Opening of exhibition at Gin–Gin Regional Courthouse Gallery called Kalkadoon. .September, 2012: Painting donated to the “Make a Wish Foundation” Bundaberg. .August, 2012: Official acceptance to the 2012 and 2013 University of Queensland’s Young Scholars programme. .July, 2012: Bookmarks produced by Queensland Parliament from my painting hanging on the reconciliation level in Queensland Parliament House called “Ajarku Muruu”. The bookmarks will be given to overseas dignitaries as gifts when they visit Qld Parliament. .July, 2012: Artist in residence at Childers Art Space, painting on the day during the Childers Multicultural Festival. .July, 2012: Paintings displayed at NAIDOC week’s Woorabar elder’s art exhibition at Dirty Linen art gallery. .July, 2012: Story called “Teen Artist Goes National” published in the News-Mail paper in Bundaberg about her souvenir range being sold across Australia. .June, 2012: Painting displayed at Gidji art exhibition celebrating NAIDOC week. .June, 2012: Bunabiri Australia first range of Chern’ee Sutton souvenirs and gifts are now on sale in airports, art galleries and gift shops around Australia. First range of products includes plates, cups and shot glasses. .June, 2012: Artist in residence at Thabeban State School’s Celebration day helping young school children to paint their boomerangs. .June, 2012: Painting donated to The Friendlies Society Private Hospital Cane2Coral fun run. The painting will be auctioned and proceeds will go to Qld Cancer Council, Ronald McDonald House, Bundaberg Special School and volunteer groups. .June, 2012: First and second place at the Rockhampton Show Fine Art competition in the Indigenous open category. .May, 2012: Reconciliation paintings displayed at Queensland State Libraries ReconciliAction Day as well as a slide show of my past artwork and I was also an artist in residence painting on the day. The painting I created on the day was given to “Kuril Dhagun” which is the indigenous knowledge centre in appreciation of the wonderful event that they organised. The painting now hangs in the Queensland State Library. .May, 2012: First place in the Captain Cook 1770 Festival art competition in the open category. .May, 2012: Some artwork designs have been donated to Queensland Indigenous Health and the artwork has been reproduced onto a bus that will travel from the Fraser coast to Longreach and up to Rockhampton. .April, 2012: Artwork donated to Gidji Art Shop for them to use on their new brochures to promote their shop and the artist’s works for sale in Bundaberg. .March, 2014: Paintings acquired by MMG mines and displayed at the official opening of the Dugald River mine near Mt.Isa, Qld. The paintings are now permanently on display at the new mine. .March, 2012: Presentation cards donated to Mount Isa centre for remote and rural health and James Cook University for the 2012 "Are You Remotely Interested" Conference. The cards featuring some of her paintings are being presented to the delegates and speakers at the event. .March, 2012: Paintings exhibited at “The Close the Gap Health Day” in Bundaberg which included the new painting to be hung in Queensland Parliament House. .March, 2012: Official presentation of 2 of her paintings called “Utingat Dreaming” to Kalkadoon Communities P.T.Y. L.T.D. Paintings were accepted by Kalkadoon enterprises general manager Zane Hughes and Kalkadoon Elder uncle Doug Bruce. These paintings will be hung in the Kalkadoon Communities office and will be used for the Kalkadoon enterprises corporate logo and letterheads. .February, 2012: Painting called "Watanana" donated as the Major prize to the Bundaberg mayor’s chaplaincy support raffle. .January, 2012: Story about her published in the News mail newspaper in Bundaberg about how life has changed for me since donating my first painting to the flood victims of Bundaberg one year prior. .December, 2011: Painting called “Kali” donated to Bundaberg Lions Club to raise funds for medical research. .November, 2011: Exhibition of 17 paintings displayed for sale at Brisbane parliament House in the Annexe Foyer. .November, 2011: Paintings displayed at University of Queensland Young Achievers Program Welcome Event. .October, 2011: Paintings displayed at Artspoken: Regional Arts and Culture Conference 2011 in Bundaberg. .October, 2011: Donated a painted banner for “Umoja” which is an orphanage in Kenya, Africa. .September, 2011: Painting named “Iran-Iran” donated to Lomani AU Childrens Home, Fiji for a fundraiser. .September, 2011: Paintings exhibited at “Dirty Linen Art Gallery” opening in Bundaberg, Qld. .August, 2011: Paintings displayed and exhibited for sale at “Wooroobar” Elders Shop in Bundaberg. .August, 2011: A Painted guitar and a painting donated to the Bundaberg Women’s Indigenous Football Team for a fundraiser. .July, 2011: Designed the Indigenous jersey for the Indigenous football team at Kepnock State High School. .July, 2011: Commissioned by Department of Communities Rockhampton to design their Recognition night award certificates for 2011. .July, 2011: Awarded “Youth of the year” for Wide Bay NAIDOC Week 2011. .June, 2011: Painting called “The Gift of Angels” donated to the Pyjama Foundation for a fundraiser in September. .May, 2011: Painting “Waru-Waru” was exhibited in Childers Art Space in the emerging artist’s space in an exhibition called “Showtime”. .May, 2011: Donated a painting named “Light the way to a brighter future” to a local cancer fundraiser and raffle. .May, 2011: Donated a painting called “Listen” as the major prize to the Bundaberg mayor’s chaplaincy support. This fundraiser through donations and the raffle raised a much-needed $14,000.00. .May, 2011: Designed the new logo for I.L.E.E.P. which is Indigenous Learning Education Engagement Place which will be used on their shirt emblems at Kepnock High School. .April, 2011: Designed a banner for “Close the Gap Day” for Kepnock High School which is now hung in their hall. .March, 2011: Painted and sold a painting called “Homeless” for community solutions youth support” which will be rotated and displayed throughout schools in the Bundaberg District to bring wider attention to “Youth Homelessness Matters Day”. January, 2011: Auctioned off a painting called “Gindjurra” and poem through the local newspaper for the flood victims of Bundaberg and raised $1,950.00 which was donated to the junior cricket and netball clubs to help the kids get back out and play again. Quality Authentic Aboriginal Artworks, Crafts, Artefacts and Didgeridoos in Sydney.